Local park and recreation agencies provide health and wellness opportunities for all populations in communities across the country. As America continues to face serious health issues, parks and recreation offer an affordable and accessible solution. 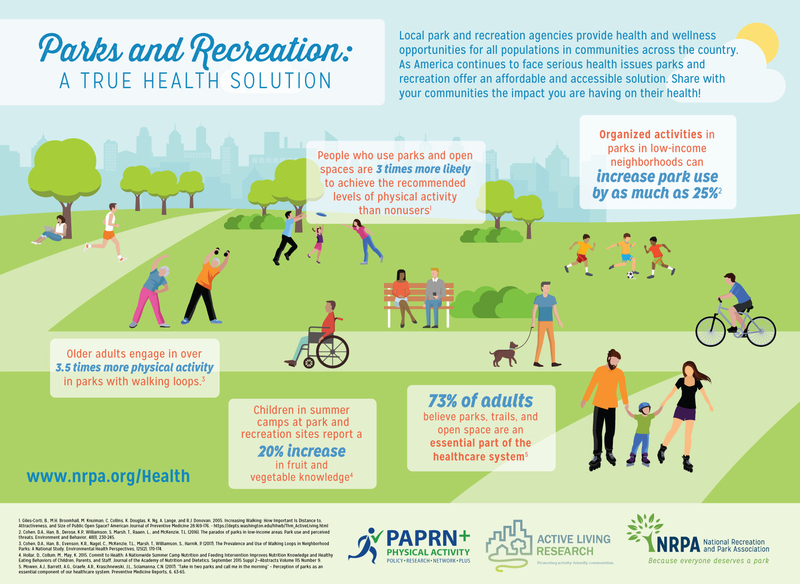 This infographic, created by a collaboration with Active Living Research, the Physical Activity Policy Research Network Plus (PAPRN+), and the National Recreation and Park Association (NRPA), highlights some of the latest evidence on how parks and recreation programs are improving community health. You can download in JPG format (963 KB) by clicking on the image above or the "Download Original" link at the bottom of this page. It is also available online on the NRPA website here. A high resolution PDF version (2.11 MB) is also available upon request. When requesting, please let us know how you intend to use the infographic.